Following the most recent high-profile knife attack on an elderly man out innocently running his party, the Metropolitan Police have revealed that they are now searching for a serial attacker after linking a series of recent knife attacks on men in London. "There have been a series of high-profile knife crimes in recent months and we now feel we have found the evidence needed to link them together," explained Detective Inspector Patrick Billingsworth. 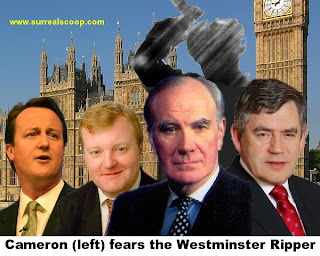 "The recent attack on Sir Menzies Campbell is the fourth in a series of attacks on high-profile Scotsman in Westminster. Friends and relatives of Sir Menzies say that his attacker came from nowhere and distracted him with talk of rallying behind him, it was at this point that Sir Menzies felt the plunge of the dagger into his back. The manner of the attack is enabling investigators to pinpoint older unsolved woundings and murders that fit the same pattern. It seems the attacks focus on men born in Scotland and living in the London borough of Westminster. The attacker is believed to have struck many times over the last several years but it was thought he had gone to ground following an attack on a fellow party go-er from Scotland. The victim, after a long lunch, was attempting to make his way unsteadily through a proposal on tax reform when the attacker struck. "Fortunately I'd had a couple of drinks which enabled me to overcome the shock of having been stabbed in the back and I could seek recovery with a lucrative book deal." said Mr Kennedy. Police say that a couple of his other victims have only been lightly wounded, such as a Scottish man from Downing Street who suffered a minor injury from the ‘Westminster Ripper’ which led to an embarrassing infirmity and re-assessment of priorities. "It gave me quite a scare, and did make me consider the whole issue of inheritance," explained Mr Brown from his recuperation in Portugal. People on the streets of Westminster are concerned not only that the Ripper might strike them but that they could fall victim from copycat crimes. "The real worry is that all of the victims have been born in Scotland. Let us hope that the Police can catch him before he strikes again. Especially if he becomes confused over Englishmen who simply have Scottish surnames." said local man, David Cameron.